Head, Arms and Legs Are Moveable. DC Comics Justice League 4" Lot of 5 Action Figures Great Condition! Dc comics action figures lot # 2 Justice League Batman The Flash Cyborg Arrow. Condition is Used. Shipped with USPS Priority Mail. Lot of dc comics action figures. Only displayed. Smoke free home. Adult owned. 100% feedback score. Fast shipping. What you see is what you get. 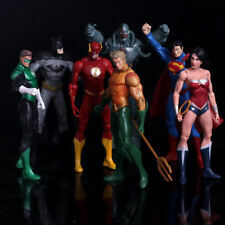 Description : These are fantastic superhero action figure sets. They vary in size depending on the character but are all within 15cm to 17cm tall. Justice League Set includes: Batman, Superman, Green Lantern, Wonder Woman, The Flash, Cyborg and Aquaman. Justice League Dark New 52 Zatanna Action Figure - Free Shipping . Condition is New. Shipped free with USPS Priority Mail. Joints are tight. Condition is Used. DC Justice League Battle-Ready Wonder Woman 6-Inch Action Figure NEW! Includes Battle Axe and Morning Star accessories with new armor battle suit. It has marks, streaks, spots. Also has worn, rubbed and flaked off paint. 2 SUPERMAN. NEW IN BOX. Booster Gold features a bold, enhanced power suit, refreshed facial designs and iconic details. There is also added articulation at the knees for even more posing and battle action. You can collect them all for the ultimate DC combat play. Cyborg (4" tear in back, but still displays great from front). Included in this lot Green Arrow. DC Direct Alex Ross Justice League Red Tornado Action Figure Series 5 New 2008. Condition is New, never been opened but with some shelf wear on the box. Shipped free with USPS Priority Mail. Wonder Woman Batman V Superman Action Figure. Condition is Used. Shipped with USPS Priority Mail. Figure body is the Justice League Batman from the DC Multiverse line. Great for custom figures! Superman,Green Lantern,Darkseid,Wonder Woman. Box shows wear due to storage but contents aren't affected. This item is brand new and ready to ship! Willing to negotiate so please send offers! This is a very hot item and will sell fast. Extremely fast shipping. Please message me with any questions or concerns! DC Comics Multiverse Justice League Figures Loose Superman "Free Shipping"
DC Comics Multiverse Justice League Movie Batman Exclusive Action Figure 6". Condition is brand new, but will be shipped without box. Message to discuss shipping with original packaging for additional shipping costs. 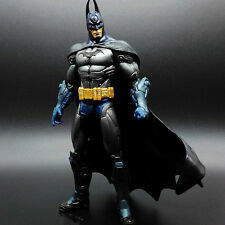 4.5 out of 5 stars - DC Comics Multiverse Justice League Movie Batman Exclusive Action Figure 6"
3 product ratings3 product ratings - DC Comics Multiverse Justice League Movie Batman Exclusive Action Figure 6"
11 points of articulation for authentic posing and battle play. Upgraded designs and enhanced power suit. Batman Justice League of America Series 2 DC Direct Action Figure Loose 2008. Condition is Used. I will do my best to work it out. Trending at $7.00eBay determines this price through a machine learned model of the product's sale prices within the last 90 days. New in Box. Never Opened or Displayed. Condition is New. Unopened Box. Mezco Toyz 1/12 One 12 Collective DC Justice League Darkseid Figure - Brand New!